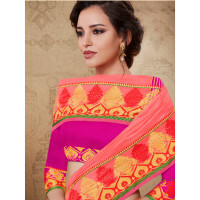 Stylee Lifestyle presents the all new collection of Banarasi Silk Jacquard Saree. Pair them with matching accessories to look trendy and gorgeous. Elegant Contrast Traditional Jacquard Weaving Border With Jari.